Four camping sites in the Philly area that'll scratch your itch for nice scenery, fresh air, and adventure — all in one trip. After a long winter, we are SO ready to hit the great outdoors now that nice (and warm!) weather has finally arrived. Hiking, camping, and sunbathing (with proper sun protection, of course) are top priorities on everyone’s to-do list. The only issue is finding time to do these fun things — not to mention packing and driving there and back. Our suggestion? Clear out a weekend or two on your calendar this season for a trip into nature. Trust us, it’s worth it. Now that you’ve made the time, the real question strikes: Where should I camp? Not to worry, we’ve got you covered there. We chatted with Christina Saboe, formerly of Fireside Camp Supply, and Charlotte Bronner, co-owner of Trove General Store, to see where they go when the camping bug bites. Below, their top picks for where to pitch a tent around Philly. This state park offers a massive block of connected forests between Washington, D.C., and New York City and is a known oasis for people and wildlife alike. Your time at French Creek can be action-packed with swimming, fishing, and biking — or spent relaxing comfortably in a fancy yurt equipped with fire pits, fridges (!! ), and cook tops. The coolest part? Bronner notes that you can take knowledge-boosting classes at the park, like Fishing 101. Saboe agrees that this is an awesome local camping spot, saying it’s “great for first-time campers or families with young children because French Creek is so close to the city that you could easily just head back to town if things don’t go your way.” Here’s to hoping you make it through the weekend, though! Starting at $25.50 per night Monday through Thursday for Pennsylvania residents; $29.50 per night for Fridays and Saturdays. Includes $6.50 transaction fee. OK, so this is our pick, not Saboe’s or Bronner’s, but we think you’ll like it anyway. 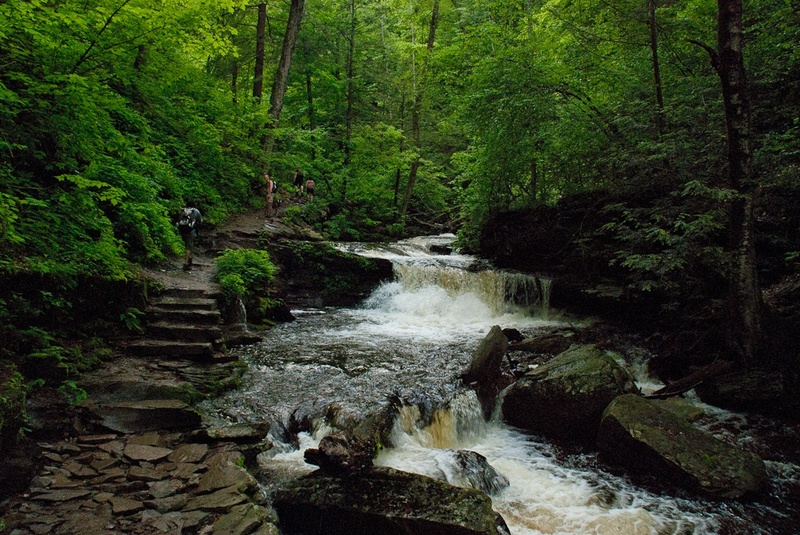 Take a tour of Ricketts Glen’s 22 ahh-inducing waterfalls on the Falls Trail, a 3.4-mile loop of moderate difficulty that leads you in and around most of the waterfalls, displaying the park’s beauty (hey, stunning rock formations!) in all its glory. After you work up a sweat climbing through the falls, cool off with a swim at the park’s Lake Jean, where canoe and kayak adventures are welcome as well. When it’s time to hit the hay, set up your tent and sleeping bags in the park’s campground. Starting at $25.50 per night Monday through Thursday for Pennsylvania residents and $29.50 per night for Fridays and Saturdays. Located right by the Cape May ferry drop-off, Cape Henlopen is just a short walk from the beach, so you can indulge in fishing or swimming. The ultimate pro tip, according to Saboe, is to “reserve a much larger and sandier tent-only site well ahead of time for more privacy,” because Henlopen tends to get crowded with people escaping the city in summer. Bird watching and disc golf are a couple other activities to add to your agenda. Starting at $35 per night for tent camping. Wharton State Forest (also known as the Pine Barrens) boasts countless state park campgrounds as well as a number of rivers, streams, and hiking trails. As Saboe says, “Fishing and canoe camping is where the Barrens shine.” As a bonus, this under-appreciated network of campgrounds hardly ever fills to capacity, meaning you’re almost guaranteed a spot, even at the height of the camping season. Starting at $5 per person per night for a “primitive campsite,” with discounts available for New Jersey residents. Additional reporting by Natalie Crane.